The University of New Brunswick’s historic Somerville House has appeared in the news recently following the completion of repairs to the sewer lines and veranda of the Victorian-era residence. The university’s associate vice-president for capital planning and property development, Barbara Nicholson, says the repairs to the property were necessary due to concerns over water infiltration and wood decay. "Frankly this work was overdue and was needed to preserve the asset," said Nicholson. Nicholson explains that the university sold its property at 58 Waterloo Row in 2009 when Somerville House was donated to UNB. A dedicated trust was created from the sale of 58 Waterloo and was used for the recent renovations to Somerville House. "These recent repairs to Somerville House cost a little more than you would normally expect because of heritage considerations," says Nicholson. "Also, we discovered problems related to the municipal water and sewer lines running to the house and we decided that it would be more cost-effective to deal with those problems now instead of digging it up again in a few years," adds Nicholson, who points out that no tuition or taxpayer dollars were spent on the project. Originally built in 1886, Somerville House has a long and rich history in New Brunswick. It has previously housed UNB presidents as well its law school, and was home to the province’s lieutenant-governor. 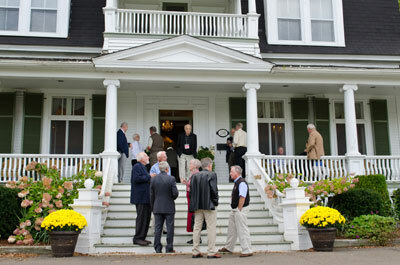 Somerville House was originally donated to UNB by Lord Beaverbrook following his purchase of the property in 1948, but the residence was eventually sold to a private owner in 1973. "Today Somerville House is not only the home of the president," says Nicholson. "The residence is used for numerous university and community events and is one of several historic properties the university is fortunate to possess." "We are fortunate that the president and his family have offered to live in this public facility and share their personal space with the community. If Somerville House were owned by someone other than the university, it would not be open to the public." Somerville House is one of a number of real estate assets donated to the university that require capital upkeep. A dedicated trust has been created from previous sales to ensure that student and taxpayer funds are not used for this purpose.